My senior year of undergrad, I was looking for all sorts of ways to go back to Europe. I applied for a Fulbright in Germany and Austria, a DAAD study scholarship, and a couple of journalism fellowships. I didn’t receive any of them, so I started applying for journalism jobs. But since I wasn’t ready to relocate outside of Washington, my options were pretty limited, and I dunno if you’ve heard but journalism isn’t exactly a growing field. 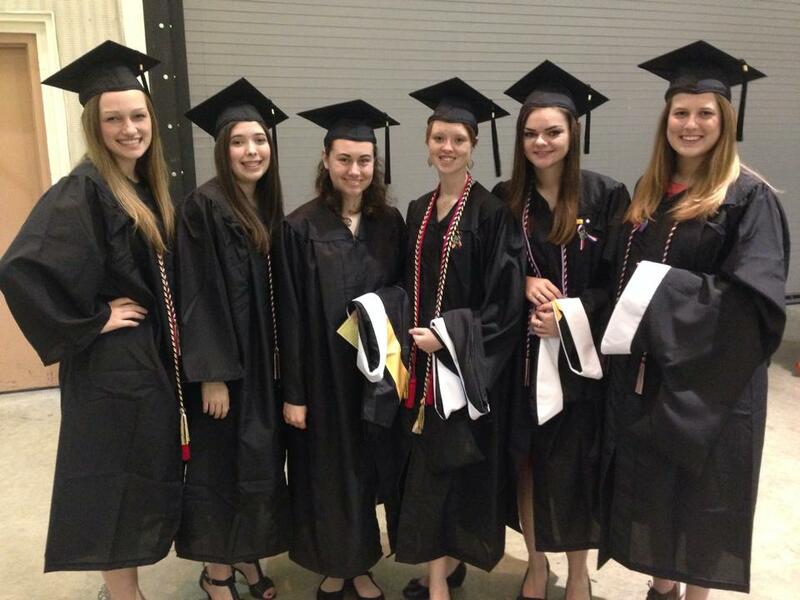 Comm majors getting ready for graduation! I’m third from the right. I had also been looking at grad programs abroad, not because I’m dying to go to grad school but because it’s SO much cheaper than in the U.S., and it’s a lot easier to travel on a student visa than as a non-student. In Germany, for instance, you get student subsidies on everything – the public transit, operas, museums, etc. In fact, in Berlin at least, a Semesterticket (unlimited public transit pass good for one semester – six months) actually pays for itself. Tuition is 650 euro per semester at both the Freie Uni and Humboldt Uni, and you actually save more than 650 euro buying a Semesterticket for 50 euro (or whatever it is) instead of a Monatskarte (monthly pass) every month for 80 euro. I looked at various programs in various cities, when in my searching I stumbled upon an Erasmus Mundus program for journalism. Erasmus Mundus is a European organization that’s very well-known in Europe, but not really heard of outside of it. The goal of the organization is to essentially get students studying abroad. It helps European Union students study in countries other than their home country, and non-EU students studying in the EU. Their undergrad programs are sort of known for their partying, but the grad programs are supposed to be a bit more serious. My friend Jon, who I visited in Cologne and again in Kaiserslautern, was doing an Erasmus program for computer science. The Mundus Journalism program is a two-part master’s program. The first year is spent in Aarhus, Denmark sort of getting everyone caught up and focusing on “journalistic theory and practice,” whatever that means to you. The second year you choose one of four specialisms and transfer to a different university in one of four cities. I chose to specialize in “Journalism and Media Across Cultures,” partly because I’m interested in transnational communication and want to be a foreign correspondent, and partly because it’s located at the University of Hamburg in Germany. Although I was nervous about the prospect of taking on debt for a degree that won’t necessarily help me find a job – journalism is all about the practical experience, not theory – it will be worth it to be back in Europe, follow my dreams, and pursue my career goals by networking with other journalists and (hopefully!) doing internships with European media outlets. I’m a little nervous about the first year in Denmark, as I don’t speak any Danish and I don’t know very much about Scandinavian culture, but I’m sure it will be an adventure. It’s been a crazy few months, enrolling in the program, paying deposits, looking for housing and applying for a residence permit. But I will be staying in student housing (which I’m also very nervous about, after my bad experience at Studentenwohnheim Schlechtensee), and I just received word that I’ve been granted a student visa a few weeks ago. It’s all coming together! I do have a boyfriend in the states who I’ve been with for about seven months that I’ll be leaving behind, which will be tough, but it won’t be the first time I’ve said goodbye to someone and boarded a transatlantic flight, and I’m sure I’ll survive it again. Keep following my blog for more updates on my travels! Hi Darrel, thanks for the kind words. Miss you too. That’s strange – it might be because I changed my blog’s URL a couple of months back. If you go to the home page, there’s a gray “follow” button on the right where you can add your email address again. Hope all is well with you and the fam! I’ll be studying at the University of Aarhus in Denmark and the University of Hamburg in Germany. And the dorm(?) I’ll be living in at Aarhus is called Teknolog Kollegiet – if anyone knows anything about it and would like to share there experiences, I’d be much appreciative!!! basically you are from. i know Denmark is so beautiful country. may i have your Facebook id , so i can see you there. You will love Denmark. It’s wonderful. Very friendly. Danes do know how to party. They also know how to work. The language structure makes it easy to learn and with German as well as English there are many cognates. Have fun.